Winning Eleven 2014 (the Japanese version of PES 2014) received a new patch last week - just six days after Konami released their latest patch for Europe (1.04). Primarily, Friday's update was delivered to give WE 2014 users the opportunity to change their camera settings for 11v11 online, aka Team Play Lobby. As well as that, a number of bugs were also fixed, including the glitch where player icons would sometimes disappear from the Game Plan screen. Although an exact release date has yet to be announced, Konami have confirmed a new update - which is expected to be heavily based on last week's WE 2014 patch with added content - is on its way to Europe and the Americas. 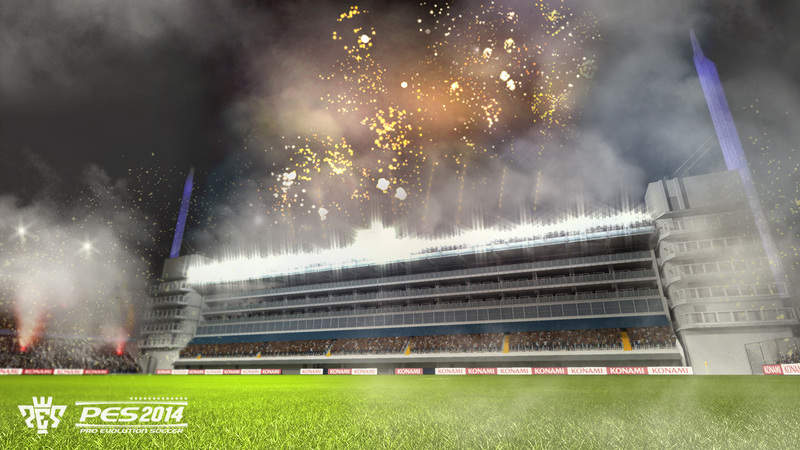 With the game launching with only 12 licensed stadiums, fans will be happy to hear PES 2014 is on the verge of getting two new additions. Originally released as PS3 pre-order exclusives for Latin America and the Middle East, Boca Juniors' La Bombonera and Saudi Arabia's Prince Abdullah al-Faisal Stadium will both be made available to everyone; on all platforms of all regions. Of course, we'll let you know as soon as a release date is announced. Until then, however, just make sure you're following us on Facebook and Twitter to stay up-to-date with everything regarding the Pro Evolution Soccer series. To finish, and in slightly less positive news, the 'traditional' Base Copy method will not be making its return to PES this year. According to Adam Bhatti, the feature was stripped down for PES 2014 because "the new graphics engine needed a lot of work".